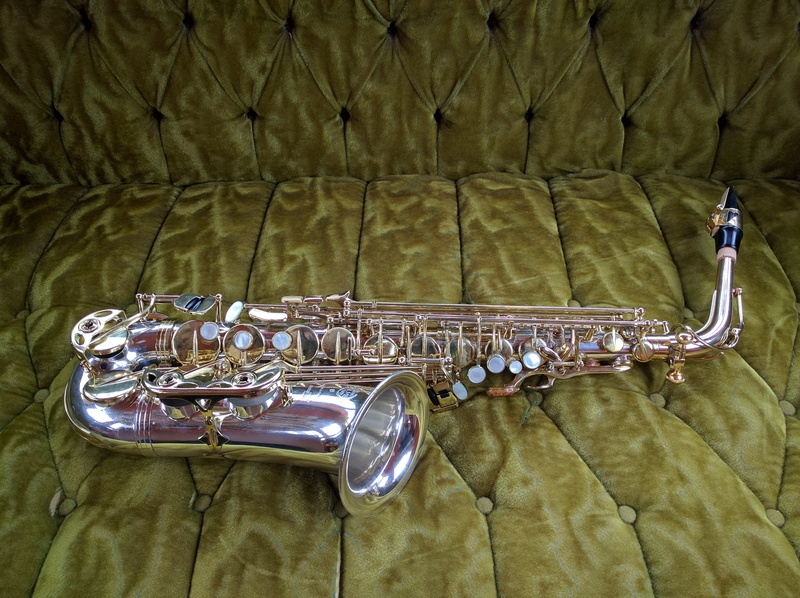 Solid sterling silver Selmer Series III alto, full mechanical overhaul. This one was a doozy! While it arrived playing decently, it just played dead and stuffy all around, with no clear culprit. In fact, the owner (an extremely accomplished classical player) had been chasing this problem for a couple years, and was growing frustrated that although a lot of money had been poured into the horn, it never played as well as it did when he first bought it. Although I suspected the pads, which were kangaroo skin and in my experience porous and deadening, I advised against an overhaul since I couldn’t guarantee an outcome and it had been relatively recently overhauled elsewhere (with regular checkups since), but despite my grumpiness and overall lack of proper business demeanor, an overhaul was decided upon and performed. As far as the work itself, Selmer QC/design is quite an animal to wrestle with (I’m looking at you, loose posts with no flat faces! ), and add to that incorrect pad thicknesses (a combination of too much adhesive and too much pad) put on in the past particularly around the C# resonance key and upper stack C# meant the geometry of that complex mechanism was all out of whack. But this ended up being one of those rare jobs where every single thing went my way, and as the time came closer I got more and more excited to play it. I’m happy to report that luck was with me, and that it now plays as evenly and cleanly as a good Series III can, AND its vibrant and powerful! One might even say loud. Its a fun job where I get to play what is surely to be a rare vintage instrument in the year 2100. Its been a little while since this one went home, and the owner is very pleased with the work. Thank goodness, I was nervous!